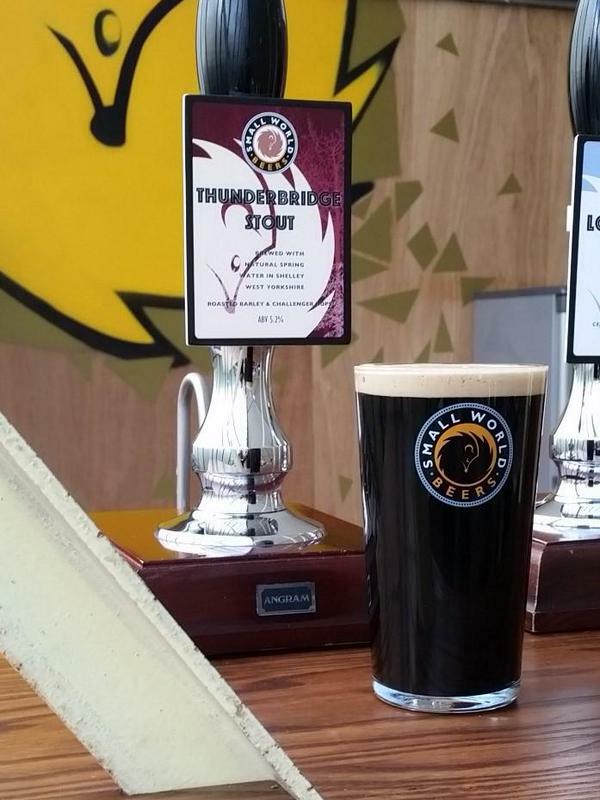 Thunderbridge Stout has won Gold at the prestigious SIBA North East Competition held at the Knavesmire in York. 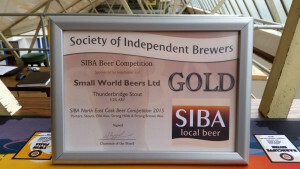 We were very excited to win this award against some top class competition from Yorkshire and the North East as Thunderbridge Stout went on to win Gold in the wonderfully named ‘Porter, Stouts, Old Ales, Strong Milds and Strong Brown Ales’ category. Thanks for the kind messages and to everyone who supports what we’re doing here at Small World. We’ve got a few manic weeks now as we increase the number of brews to meet demand, if you want to catch up with Thunderbridge it will be at a few beer festivals over the coming weeks. Firstly, how local can we get, it will be at Shelley Beer Festival over the 25thand 26th Sept, that’s at Shelley Village Hall and is open on the Saturday until dry, now there’s a challenge. Next up Thunderbridge Stout makes an appearance at the Huddersfield Oktoberfest Beer & Cider Festival, on the 1st, 2nd & 3rd October at the Apna Centre in Huddersfield, just down the road from The Grove. If you can get down there make sure you say hello to Keith and the team at Huddersfield CAMRA. Robin Hood Beer Festival at Nottingham Beer festival is the next date on tour, from Wednesday 7th to Saturday 10th organised by CAMRA and held at Nottingham Castle, not only a great location but they guarantee over 1000 different beers, our beers will be there, might take a bit of finding. Then we’re back on home turf on the following weekend with our Stout making an appearance at the Space in Wakefield, with Wakefield CAMRA celebrating their 40th Anniversary it’s sure to be a great festival.